Our 23 Days of Christmas activities series has been so fun this year! My kids are loving the activities each day and we are having fun sharing them with you! It has been nice to set aside chores and shopping to focus on connection and having a good time together each day for a little bit. 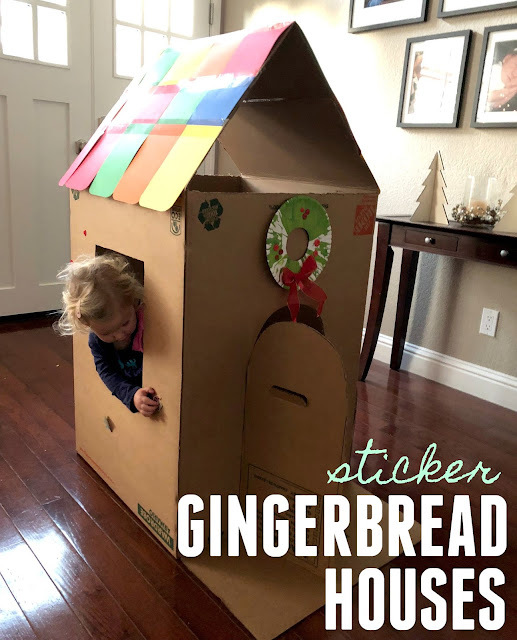 Today for Day 14 we're sharing these Sticker Gingerbread Houses! 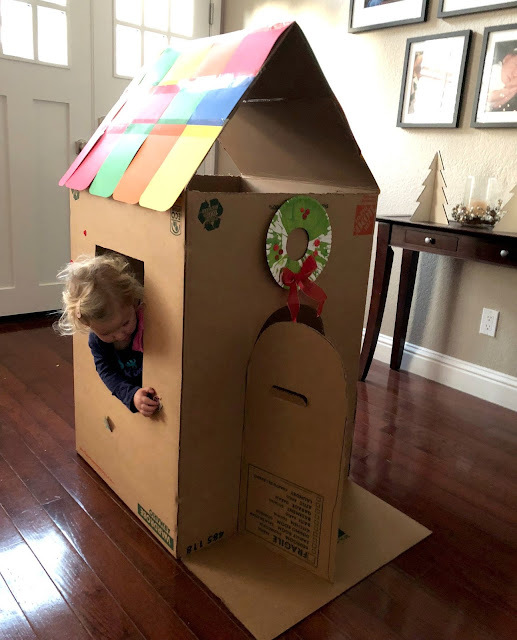 My kids played with their houses for HOURS and are still finding new ways to create with them. You must try this. Before the kids start decorating their houses, I prep it ahead by cutting off the side flaps on two sides (on the top) and then I tape them together to make a tall roof. I tap the pieces at the roof line to keep them together. Next, I cut out a door and windows. Once that is done, the kids are ready to start decorating! We made a roof for our gingerbread house using colored cardstock and packing tape. The best part of this activity is the STICKERS! The kids grab their favorites and decorate them completely with stickers. If you have candy shaped stickers, that would be awesome, but even the regular old Dory, Nemo, car, truck sort of cars are fun too. My kids also like to pull out our Do-a-dot markers and paint their houses. We usually keep the houses out for a week or so and they are constantly finding new ways to create and play with them. Once activity they loved was using play hammers to hit golf tees through the cardboard. LOL. So then their houses were covered in little gold tees. I let them follow their own creative paths (within reason), while I catch up on Christmas online shopping and getting the house ready for Christmas. The kids also sometimes pretend their houses are dog houses or houses for their animals and they bring them all downstairs and play with them inside. If you make your own Gingerbread houses out of cardboard boxes, send me a picture! I want to check them out! Not only is this activity FUN, but kids also work on different skills while they play! As they engage in pretend play they are using their imaginations. As they chat and work together with siblings or friends they are working on building their language skills and practicing good manners too. We talked a lot about waiting for turns with materials and practiced how to do that happily. Turn-taking and sharing are important social skills. Kids also strengthen finger muscles when they are pulling and sticking stickers on the house. Strong finger muscles help kids as they learn to write! Painting and moving around to create help kids develop their large motor skills as they open and close doors, go in and out, and use big arm movements to paint their entire box. There are so many great things happening during this little activity. I love it! Here's what it looks like with 3/4 kids having their own little house! LOL! They are taking over my house. Here are all of the fun things we've been up to so far this month!